The TRIPS Agreement was implemented in the WTO to gain access to a functioning dispute settlement mechanism that could authorize trade sanctions. Yet TRIPS and the WTO Dispute Settlement Understanding are based on systems that developed independently in WIPO and GATT. 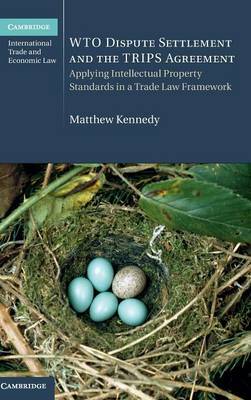 In this book, Matthew Kennedy exposes the challenges created by the integration and independence of TRIPS within the WTO by examining how this trade organization comes to grips with intellectual property disputes. He contrasts the way intellectual property disputes between governments have been handled before and after the establishment of the WTO. Based on practical experience, this book provides a comprehensive review of the issues that arise under the DSU, TRIPS, GATT 1994 and other WTO agreements in intellectual property matters. These range from procedural pitfalls to substantive treaty interpretation and conflicts as well as remedies, including cross-retaliation.